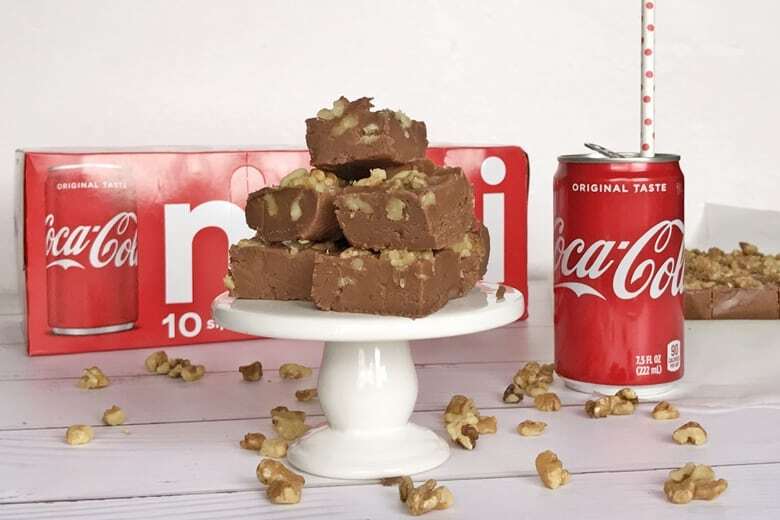 This rich and chocolatey Coca-Cola® Fudge with Walnuts is made using real Coca-Cola®, so you just know it is incredible! I love this time of year! The holiday season means spending time with family and, of course, lots and lots of great holiday eats. Between Thanksgiving, Christmas, and New Year’s Eve we have a lot of occasions to celebrate coming up, so I will be making lots of holiday treats to share with family. Homemade fudge has always been one of my favorites, but this year I wanted to try a homemade fudge recipe with a new and exciting twist. My husband and I love Coca-Cola® and Diet Coke®. In fact, I am sipping on a Diet Coke® as I write this post. So, I thought, what would be better than a fudge made with my favorite soda — Coca-Cola®!? And I couldn't be happier with how the fudge came out. 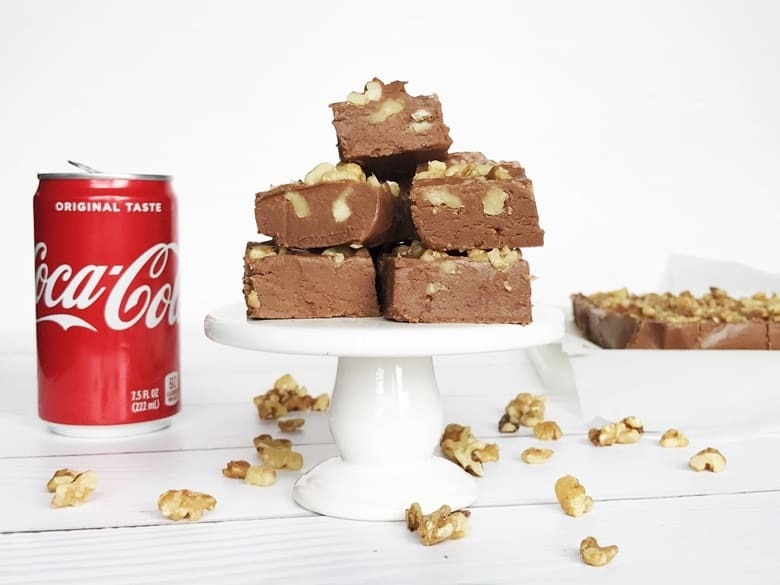 This tasty Coca-Cola® fudge is basically like a sweet little slice of heaven. I can't wait to share it with my family and friends this holiday season. I have found that Coca-Cola® Mini Cans, available at Sam's Club, are the perfect size for making Coca-Cola® Fudge. Rather than opening a full-size can and only using part of it, this recipe uses 1 entire Coca-Cola® Mini Can. So efficient! Coca-Cola® Mini Cans and Sprite® Mini Cans are also absolutely adorable, and the perfect size for when I am craving a soda. 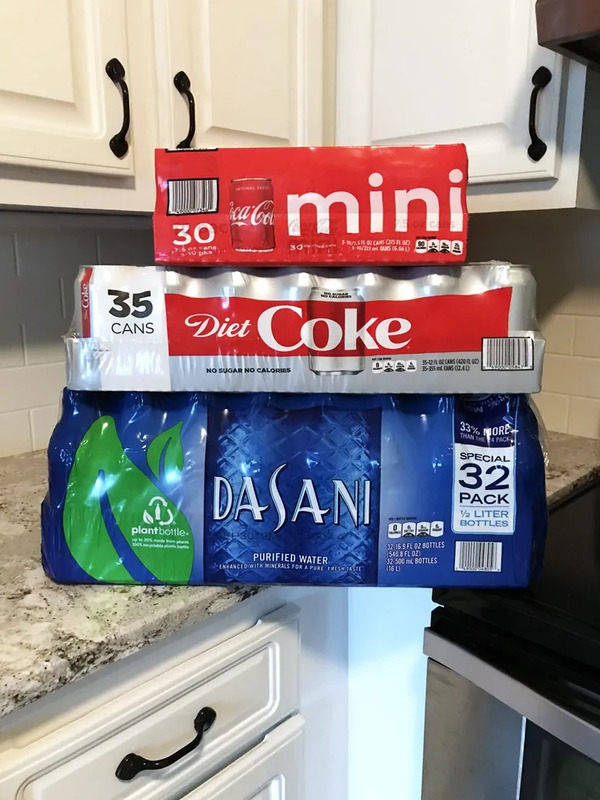 On my last trip to Sam's Club I picked up Coca-Cola® Mini Cans along with a variety of other great beverages to serve my guests this holiday season. To give my guests the greatest variety of beverages, I like to stock up on Coca-Cola®, Sprite®, Gold Peak® Sweet Tea, Dasani®, and Diet Coke® at Sam's Club. By shopping at Sam's Club I get a great value on beverages for holiday entertaining. Plus, Sam's Club offers Club Pickup which is perfect for busy mamas like me. After ordering online, Sam's Club has everything ready for me to pick up as soon as I arrive. I will definitely be taking advantage of this time-saving service throughout the holiday season. If you love sweet treats, you are going to love this Coca-Cola® Fudge. Now, grab a 9 x 13 baking pan and line it with parchment paper and a light coating of non-stick spray. Next, melt butter in a large pot over medium heat. Once the butter has melted add the sugar, evaporated milk, and a Coca-Cola® Mini Can. Stir continuously until it comes to a full boil. 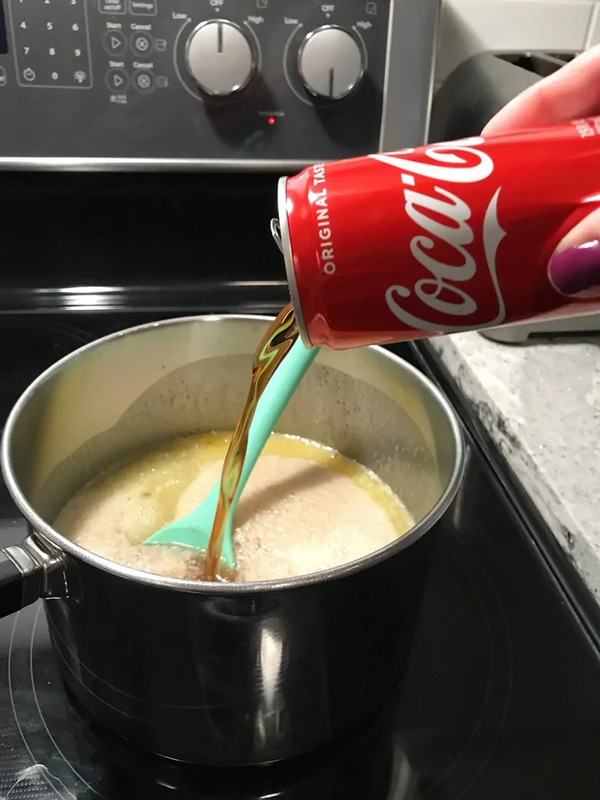 Now this will take some time, so you might want to do yourself a favor and have an extra Coca-Cola® Mini or Diet Coke® handy so that you can enjoy a Coke while you stir. Once the mixture comes to a full boil you will need to cook it for 5 minutes. So, set a timer for 5 minutes and continue stirring constantly. After 5 minutes, remove pot from heat and add chocolate chips and marshmallow creme, stirring until the chocolate has melted and the texture is uniform and smooth. Stir in walnuts. Pour the mixture into your 9 x 13 pan and sprinkle with remaining walnuts. Place fudge in refrigerator for 2 hours or until firm. Once chilled, pull the ends of the parchment paper to lift the fudge out of the pan and onto a cutting board. Cut and serve. I hope that you and your family enjoy this delicious fudge recipe this holiday season! Learn more about these products at Sam's Club here. 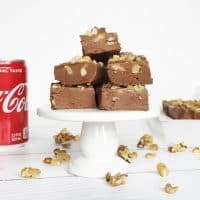 Rich and chocolatey Coca-Cola Fudge with Walnuts is made using real Coca-Cola, giving it a great kick of Coca-Cola taste. Prepare a 9×13 pan with parchment paper and a thin layer of non-stick spray. Set aside. Once butter has melted, add sugar, evaporated milk, and Coca-Cola. Bring mixture to a full boil, stirring constantly. When it has reached a full boil, cook for 5 minutes, stirring constantly. Remove pot from heat and add chocolate chips and marshmallow cream. Mix well until texture is smooth. Stir in 1 cup walnuts. 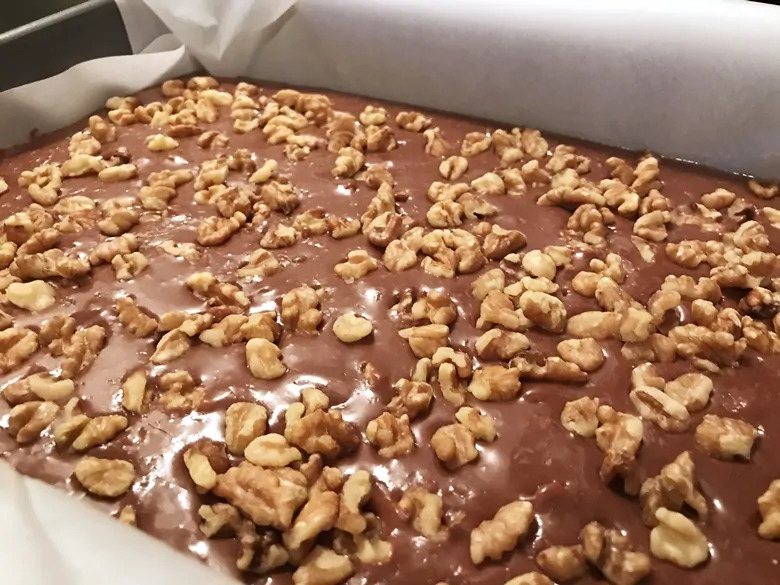 Pour fudge mixture into pan and sprinkle with remaining ¼ cup walnuts. 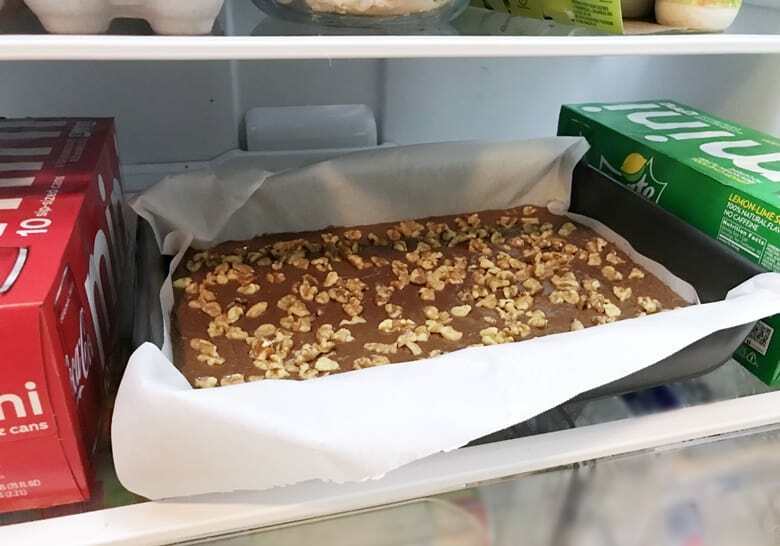 Refrigerate fudge for 2 hours, or until firm. Cut and serve. OMG this looks amazing! Wow – I just love coca-cola flavouring in so many things (Coke floats are my favourite) I need to try this fudge. I am definitely going to have to try this fudge for the holidays. My son is a fan of both Coke and fudge so this would be a great gift for him. 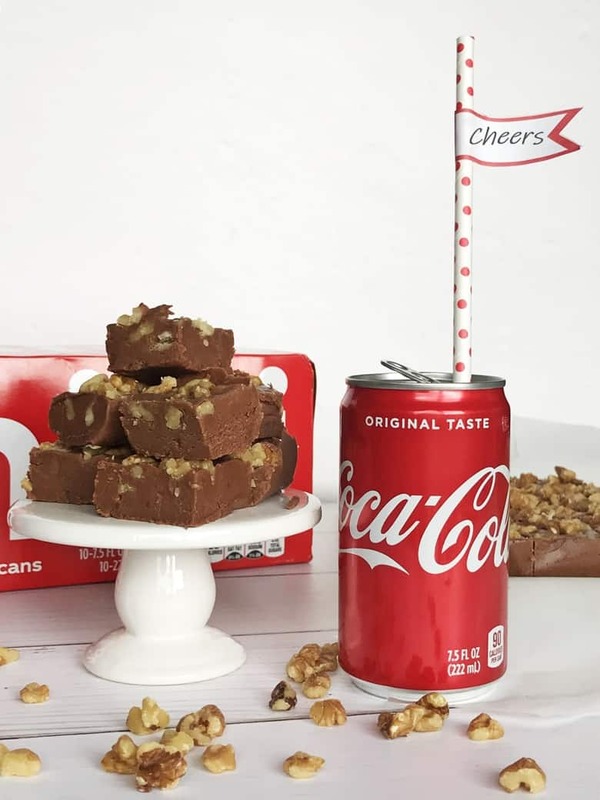 I had no idea you could make fudge with Coca Cola, that looks delicious! So cool! I’m going to share this with a friend who loves coke. I make Coca Cola cake but I’ve never tried Coca Cola fudge. I am going to have to remedy that! To be honest, I am not sure if swapping out the marshmallow creme for marshmallows would work for the recipe — I have never tried it. I think that your best bet would be to try to make your own marshmallow creme (there are lots of recipes out the for it if you check google). Let us know how it turns out! Could you use white chocolate chips? Have you tried making it with Diet Coke? I have not – I only tried making it with regular Coke. Sorry! If you do decide to give it a try I would love to know how it turns out! Made your fudge 4 1/2 hours ago and it still has not set up. I used Dr. Pepper instead of Coca cola; could that be it? Oh no! 🙁 I have only made with recipe using Coke, I have not tried it with another soda. Mine did not set up either. Kept in frig and used fork to eat. I went exactly by the recipe. If you do not have mini coke but have regular size coke cans, what would measurements be ? The Mini Coke cans measure 7.5 oz – just shy of 1 cup. To be exact, it would be .9375 cups of Coke. So, basically 1 cup of Coke. 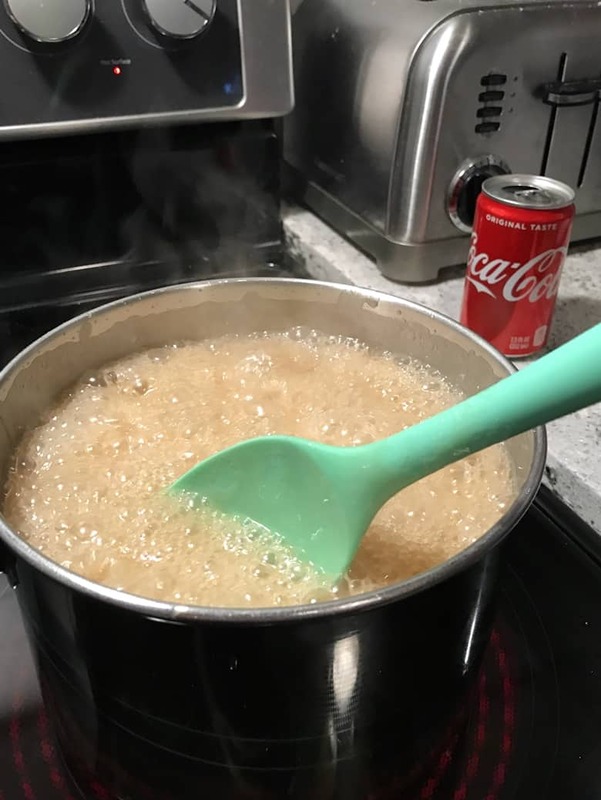 I would use a measuring cup to measure out just a hair under 1 cup of Coke. 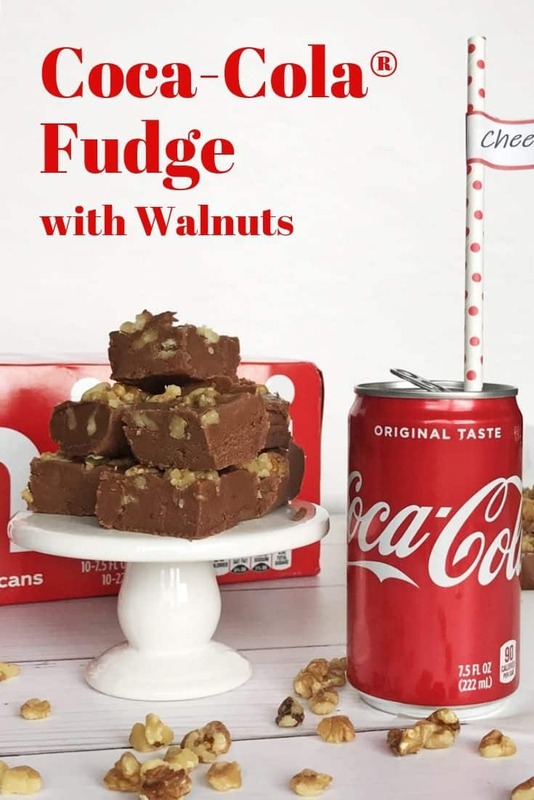 I have used your fudge recipe for Coca-cola fudge with walnuts. It will not set up. Maybe have to cook it longer then 5 minutes. The taste is really good. I retried to boil some of it but still not setting up . Any suggestions. I used everything exactly like the recipe says. Usually when fudge fails to set up properly it is due to not boiling at a high enough temp or for long enough. Make sure that it comes to a full boil before starting that 5 minute timer. It should be boiling well enough that even as you stir it, it is still boiling strong (be careful!). Some people use candy thermometers when they make fudge to make sure the temp is high enough, but I have always just gone by making sure it reaches a nice strong boil before cooking for that 5 minutes. Why didn’t my fudge set up and become firm? I followed the recipe exactly, it’s been in the fridge for 10 hours. I went to cut into it to try a piece and it’s a gooey consistency. Actually need to spoon it out of the baking dish. So disappointed, I hope someone can help me with where I went wrong. In the past I have had trouble getting fudge to set when I didn’t boil it long enough or at a high enough temperate. The fudge really has to come to a good, strong, rolling boil — boiling so well that even as you stir it, it is still boiling strong. Then continue to boil it, while stirring, for 5 minutes. I hope you are able to give it another go — it really is a delicious fudge! This does not set up. a bit waste of time and money. If you use a wooden spoon to stir with, sometimes, when making puddings and/or candy it will not set up. Well I just put a pan in the fridge. I am definitely worried about it because it seems runny. I definitely did a rolling boil for 5 min with a little over and it doesn’t look like the consistanty of the many many pans of fudge I have made. I had the same issue with it not setting up, and that was after reading the other notes. I made sure it was at a full rolling boil before I started the timer. Very disappointing. Mine came out well 🙂 Thanks for receipe! After reading from those that their fudge didn’t set, I was wondering if the weather has anything to do with how well the fudge sets. I have heard that weather does affect some candies.